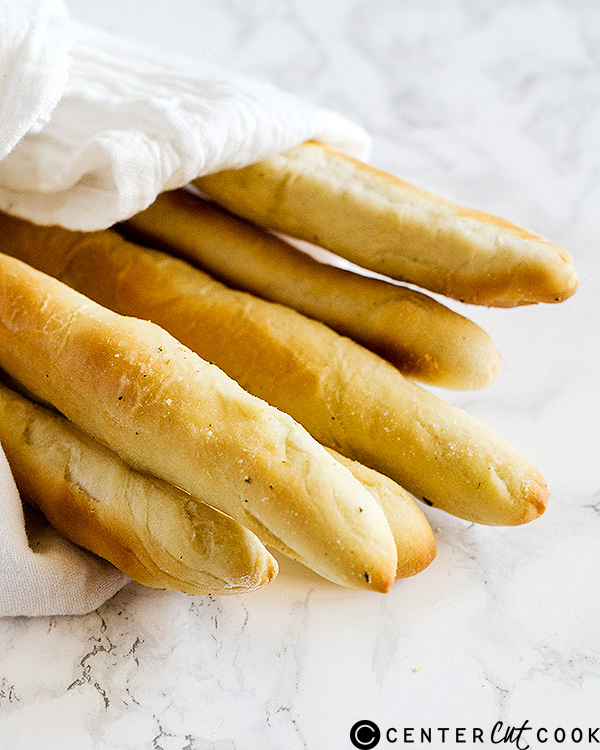 These garlic butter breadsticks are the perfect Olive Garden copycat. They are perfectly soft and pillowy and coated with that signature salty garlic butter. You will want this for every dinner. I don’t go to Olive Garden a lot, but when I do, you can be sure that I have at least a whole basket of their garlic bread to myself. Their garlic bread is otherworldly. So buttery and garlicky and salty. It is perfect! And somehow, even after eating about three or four of these, you are still able to eat a huge bowl of pasta. I don’t know how they do it, but it is genius. Since I constantly crave those garlic butter breadsticks, I decided to make my own Olive Garden copycat. Making a good garlic butter breadstick is very easy, even if you are not good at baking yeast breads. It is the perfect way to learn how to make bread. All you need is a bit of active dry yeast, bread, butter, sugar, and water. Then brush it with garlic, melted butter, salt, and a touch of oregano. The hardest part is the waiting. You have to wait to see if your yeast is good. If it is not, it’s easy enough to replace it and start over. You won’t have used any other ingredients besides the yeast and flour so no need to worry about wasting much! But then you have to wait for the dough to rise. That is always so hard for me. 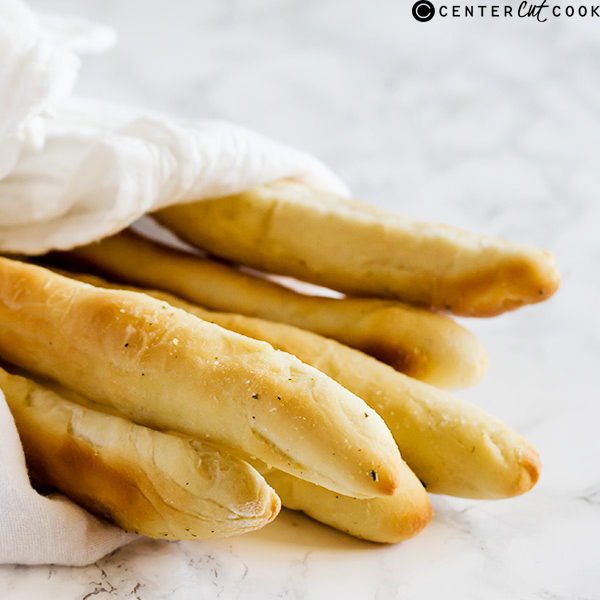 Luckily, there are ways to make the waiting easier and allow you to have these garlic butter breadsticks for any weeknight dinner. The first option would be to start making the bread in the morning and leaving it to rise for the first time in the refrigerator. By the time you come back from work, you can leave it out as you begin prepping for dinner for it to warm back up, then roll it out and bake when you begin making dinner. My favorite option is to make a double batch on the weekend and do all of the steps up until it is time to bake then freeze the breadsticks and store in an airtight container. This way, you can take out however many garlic butter breadsticks you want and baking them up with dinner. They just need to thaw out for about 10 minutes plus a few extra minutes in the oven. In a small bowl, add the yeast, water, and 1/2 tablespoon of the sugar and gently mix. Leave for 5 minutes. The top of the water should form a thick foam and smell very yeasty. That means it is proofed. If you do not see the foam, start over with fresh yeast as the yeast is dead and will not work. In the bowl of your stand mixer, add the flour, remaining sugar, and 1 tablespoon of the salt. Take 2 tablespoons of the melted butter and mix into the yeast mixture. Mix the yeast mixture into the flour. Mix the ingredients together until it starts to come together into a ball. Once that happens, put on the dough hook and knead for about 8 minutes. Remove the dough and place on a lightly floured surface. Lightly coat the bowl with grease then form the dough into a ball and place back into the greased bowl. Cover with plastic wrap and leave in a warm, dry place (if you are making these in the morning for dinner, you can leave them to rise in the refrigerator for 8 hours, just leave the dough to reach room temperature later for about 15 minutes when you are ready to make your breadsticks) for 1 hour, or until doubled in size. Deflate the dough and place on a lightly floured surface. Evenly divide the dough into 16 pieces. Roll each piece until it is about 8 inches long – it is okay if it isn’t exact. Place on lightly floured baking pans and cover. Allow to rise for 30 minutes. (you can also stop here and freeze the dough on the baking sheet. Once frozen, place in an airtight container and keep in the freezer to enjoy throughout the week. Just remove the bread right before you preheat the oven). While it is rising, preheat the oven to 400 degrees F.
Bake the bread for 6 minutes.While it is baking, mix together the salt, garlic powder, and oregano together. After the 6 minutes, brush the breadsticks with butter. Bake for another 5 – 6 minutes. Once finished brush with more butter, then top with the garlic mixture. Serve warm, but not hot.